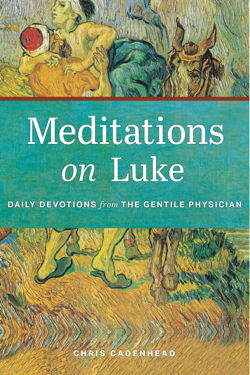 Readers searching for a fresh encounter with Scripture can delve into Meditations on Luke, a collection of daily devotions intended to guide the reader through the book of Luke, which gives us some of the most memorable stories in all of Scripture. Luke is unique among all the biblical authors because he is the only one we are certain was not Jewish. Each entry begins with a Scripture reference that picks up where the previous reading concluded. The reader is encouraged first to read the passage from the Bible, then to read Chris Cadenhead’s reflection on that passage. A prayer concludes each devotion. Taken together, the Scripture, response, and prayer will guide readers’ own meditations as they listen and respond to God’s voice, coming to us through Luke’s Gospel. Chris Cadenhead lives in Roanoke, Virginia, where he serves as the senior pastor of Bonsack Baptist Church. He previously served churches in North Carolina, South Carolina, and Florida. He and his wife, Heather, who is also ordained to the ministry, have two daughters, Ashlyn and Addie. When they are not engaged in life with their church family, they enjoy attending their daughters’ sporting events, spending time on the rivers and trails of the Blue Ridge mountains, and chasing their golden retriever around the backyard. Just as the author of the Gospel of Luke aimed to write an “orderly account” of the life of Jesus for an audience for whom the story is new, Chris Cadenhead has written a re-presentation of Luke’s good news for those who are interested in the meaning of Jesus. Like Luke, Chris is intelligent but not pretentious, thoughtful but not self-absorbed, interested above all in the story being heard intelligibly. I commend Chris’s daily devotional readings as a way of establishing habits of listening to the story of Jesus, which can transform the story of your life. Chris Cadenhead is a purveyor of grace, whether he knows it or not. His insight into Luke’s meaning and application stands as a humble tour de force of God’s grace and a call to hope in a world too often fascinated with political and economic alterna- tives to God’s hope. The book is informed by modern scholarship yet imbued with an unerring knowledge of the center, which is Christ himself. I commend it to you. Chris Cadenhead identifies Luke as a masterful storyteller. He should know because he artfully weaves his own stories into the authentic stories of Jesus as told by Luke. Chris marvelously entices the readers each day to discover new truths and lessons for themselves. The prayers that Chris shares at the end of each devotional serve as gateways to a personal conversation with Christ.